The change maker: It is not every day that one comes across such feisty leaders who have the courage and intent to inspire many more to lead a life of dignity. Meet Archana Mehra, 38, of Hoshangabad district in Madhya Pradesh. She lost her complete vision when she was 3 years old. 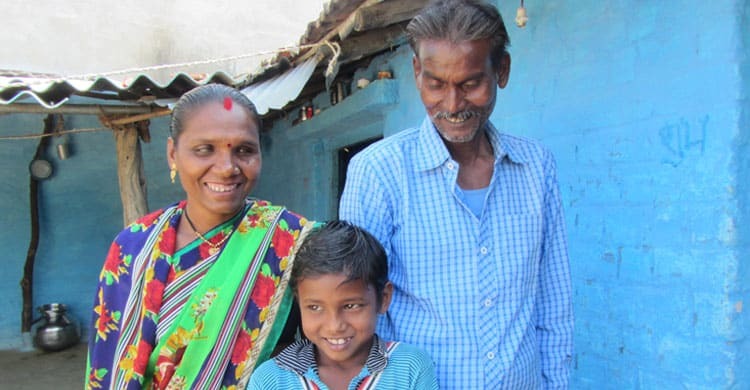 Married to Shankar Lal Mehra, a farmer, who’s a person without disability Archana lives happily with their eight year old son. She has led a life of independence, successfully doing all household chores without any hitch. Archana wanted to do a lot more, and a perfect opportunity came when Sightsavers social inclusion programme in her district was implemented by our NGO partner Dalit Sangh. Community mobilisers met Archana in Lakhanpur village of Sohagpur block, 08 kilometres away from Sohagpur. She got to know about the organization’s work with PWDs in different villages and decided to attend the disabled people organisation (DPO) meeting at Sohagpur. There she interacted with many other PWDs of different villages, everyone discussing their problems and making action plans. This motivated Archana and hence she decided to link more PWDs under this Programme. She motivated 12 more PWDs of her area to join the DPO. She has also participated in ‘Sensitization of PWDs about their rights and entitlements’ and trained other PWDs in her village about the rights she learnt. She participated in ‘Leadership, Advocacy and DPO formation training’ and ‘Training on SHG formation and strengthening’ which really moved her. After the training Archana formed exclusive self-help group (SHG) of PWDs at Lakhanpur village with 5 PWDs and named it Monika. The SHG regularly saves a small sum of money, which Archana has planned to use for inter-loaning. The change maker at grassroots, Archana participates in the awareness programmes and spreads a word to others about rights, entitlements, preventive and curative measures for PWDs. She is the leader we need, who’ll ensure the sustainability of the Social Inclusion programme initiated by Sightsavers and implemented by Dalit Sangh.